Jaffna News: The fishermen of the area have been facing eight fishermen who have been involved in illegal trade in Jaffna Vadamarachchi sea. Police are also being deployed in the area where there is a lot of tension. In many places in the Vadamarachchi East, large scale fishermen from southern Sri Lanka have been engaged in illegal business. As a result, sustainable livelihoods of many fishermen and marine resources have been demolished and continuous demands have been made to go out. Following this, several parties, including the Fisheries Minister, have been told to evict the fishermen, but they continue to stay and continue to work. 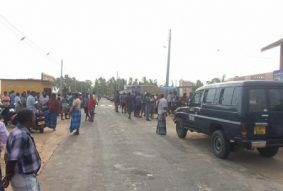 The fishermen who were staying in the area of ​​Vadamarachchi east and occupied the area illegally and eight fishermen entered the Vadamarachchi ferry and occupied the area while Vadamarachchi fishermen were detained and taken into custody. Following that, the fishermen were arrested by the fishermen who were detained and detained by the fishermen.